Image above derived from an instagram that was posted from a conference that was held a few days ago. The original image is from a photo taken by Magrethe Vestager, an MP as well as the Minister of the Economy and Interior Affairs from my home country of Denmark, whom I respect very much and have voted for in years past. She was at the conference and snapped a photo of the slide that I have since cleaned up and modified by correcting the grammar. 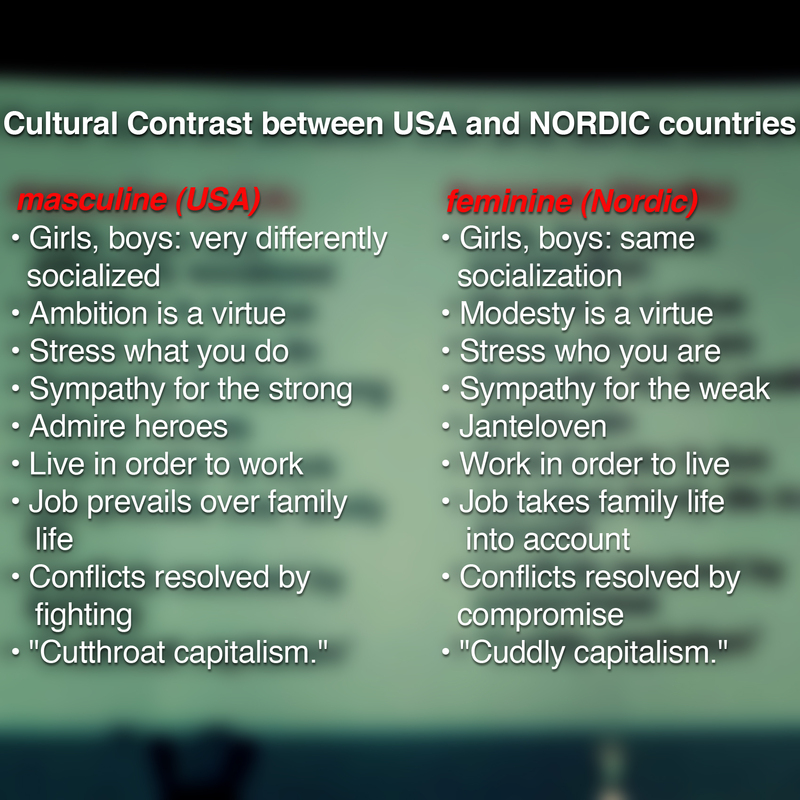 There has been an effort to better define Nordic cultural values as it applies to the workplace. One way of doing that is to compare them to their American “counterparts.” I don’t agree with each point but I think this comparison makes for an interesting discussion while I should note that, case by case, the comparisons do not necessarily favor one over the other. There is some self-reflection and self-criticism directed towards Scandinavian values as well. The reference to “Janteloven” is one. While difficult to translate directly, much less explain, Janteloven might best be compared to Australia’s “tall-poppy” syndrome: it is a strong impulse to conform to societal norms for fear of the attention one gets for standing out by way of being exceptional. In essence, Janteloven makes it harder to be exceptional in Nordic culture because one is often punished for it: one is ridiculed for being egotistic, arrogant and selfish, putting oneself before the community. It manifests itself by a particular reluctance to be recognized for excellence but also as a preference for avoiding one-on-one conflict, and potential conflict, at all costs. If it has a positive side, it also imprints a kind of humility, skepticism and occasional community-mindfulness that has its pragmatic applications. Thanks to Magrethe Vestager for kickstarting this conversation.